This deluxe set of 40 colorful cards presents 7 chakras and 33 mudras chosen for their ability to focus energy and expand consciousness. By directing breath and awareness, these mudra hand poses can deliver numerous benefits for both physical and emotional wellness. The cards present inspirational artwork on one side with instructions on the other side, so they can be used for yoga and meditation classes, on-the-go stress relief, or daily affirmations. 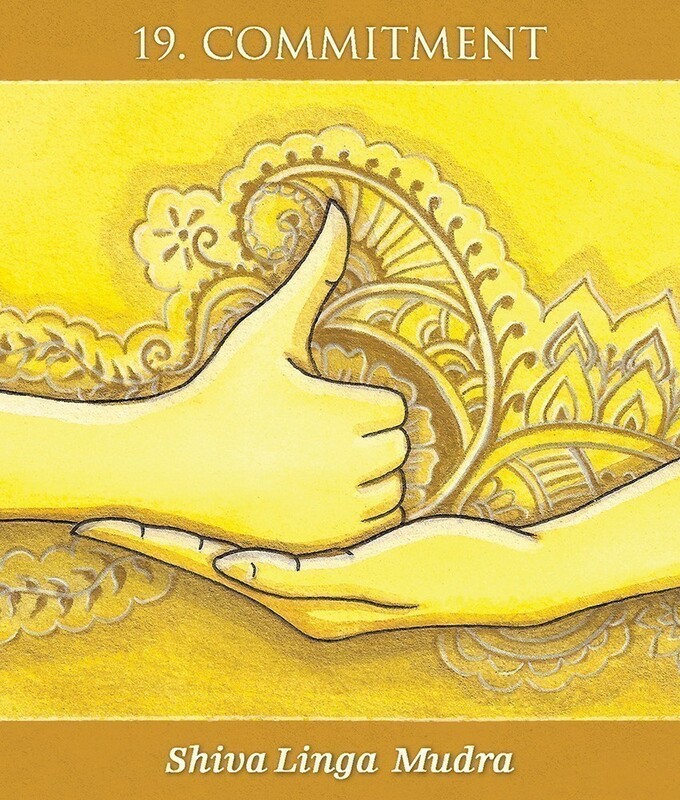 The 112-page illustrated guidebook offers instructions for the poses, information about their health benefits, and guided meditations for putting mudras into the practice. Sabina Espinet is a multi-cultural artist based in Colorado whose work is influenced by nature, mythology and spiritualism. Alison DeNicola is a Connecticut-based yoga and meditation teacher and energy healer. 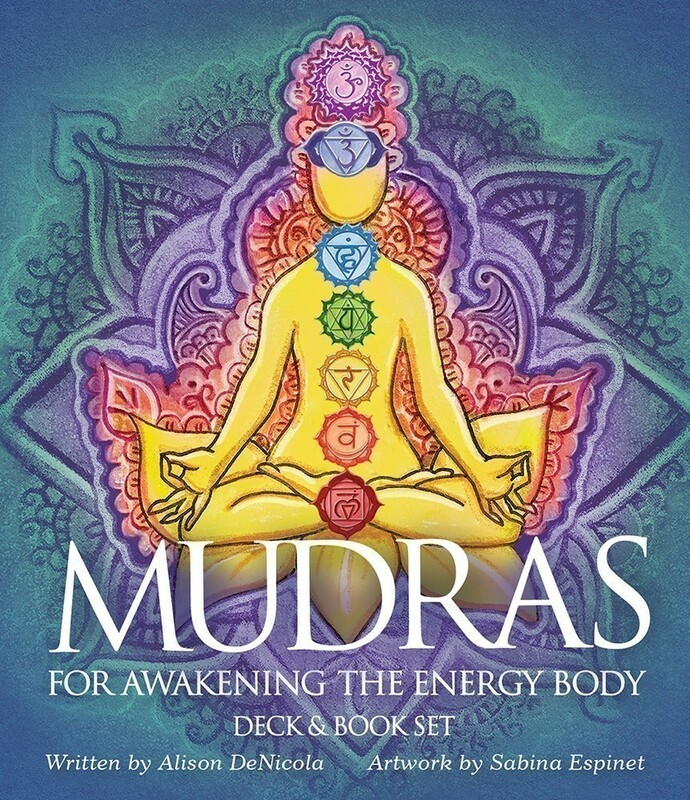 Mudras For Awakening the Energy Body is a deck and book set that I have had my eye on for months now, before it was even released out onto the market. The production value by U.S. Games here is way high. If yoga, meditation, or Eastern mysticism is of any interest to you, then I recommend that you get this deck. The book is not just an accompaniment to the cards, but is an independent text all on its own, covering Eastern mystic energy body and chakra principles to the auric field and the hand mudras categorized by the chakras they stimulate. The book itself is 111 pages, a matte finish cover, and perfect bound. The book does a fantastic job explaining hand mudras to the Western reader, so I won’t get too much into it. 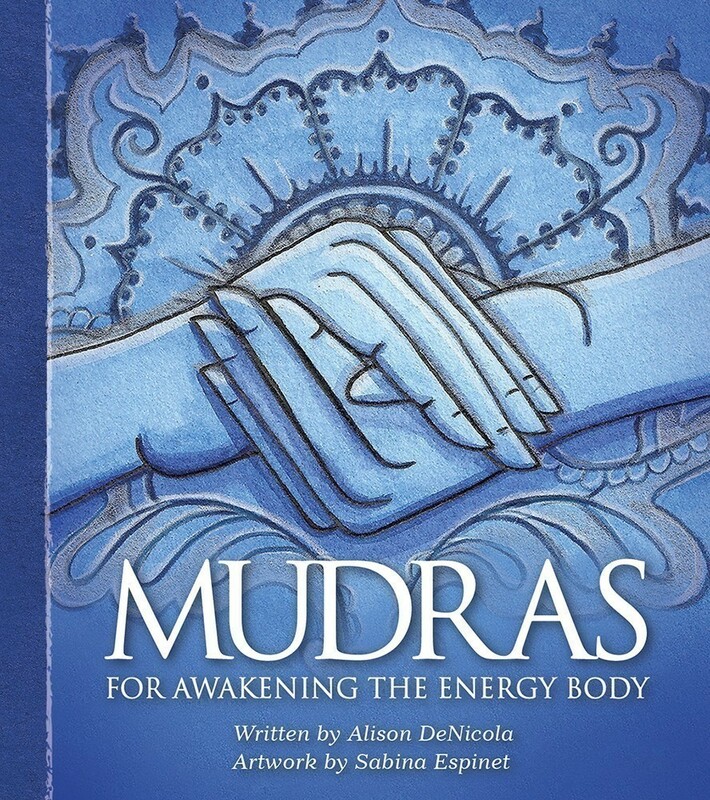 You have to get Mudras and read it for yourself. Seriously. Best comprehensive explanation ever. In a nutshell, though, Eastern mystics believe that metaphysical energy can be transferred and transmuted through your hands in very potent ways, and hand mudras are formations of the hands and fingers that serve very specific metaphysical functions. 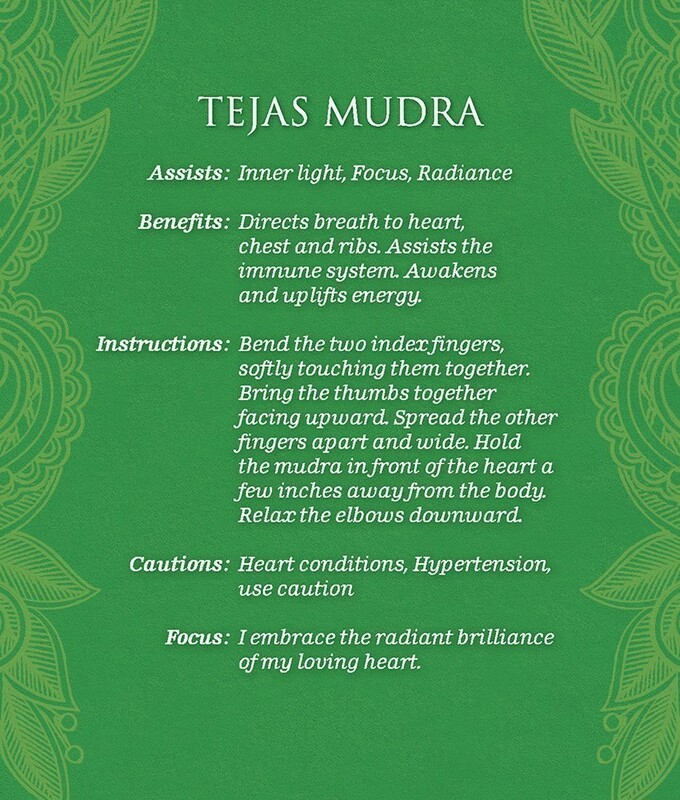 In terms of inner alchemy, which is really what this text Mudras focuses on without actually using that term “inner alchemy,” you can use hand mudras along with meditation, mindfulness, and other practices to align, correct and stimulate your personal energy body. There are so many uses these cards could serve, given the brilliant, bold coloring. You’ll see that the cards are double-sided, meaning there are no “card backs” as you might find in traditional oracle decks. 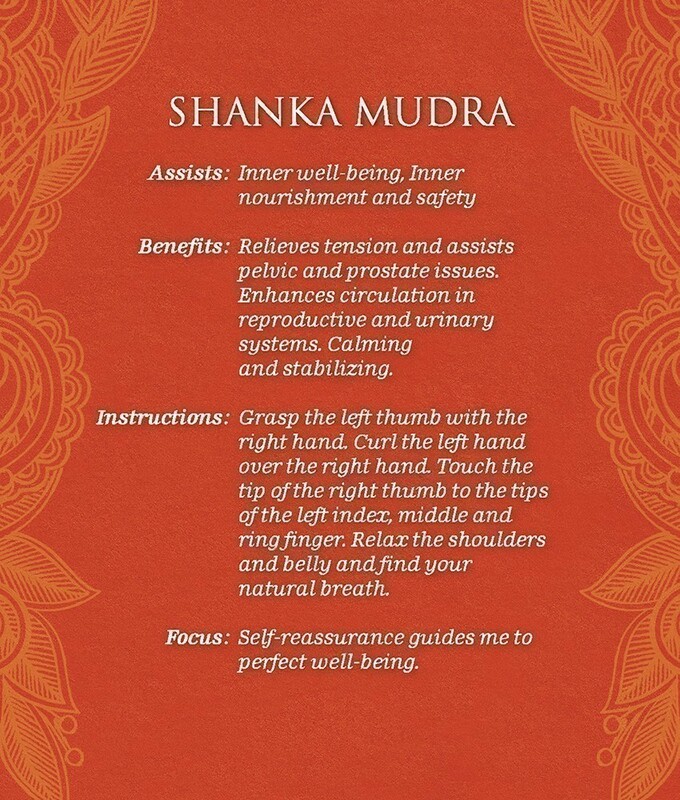 One side covers one of the chakras or hand mudras, and the other side offers text to explain the chakra or mudra. So you can use these cards as a learning deck, to educate yourself. 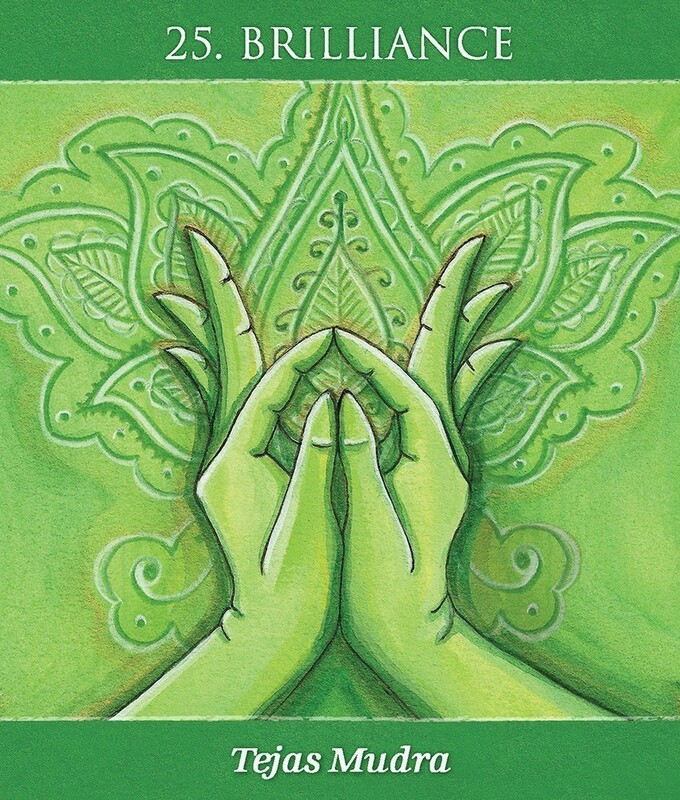 Next, the hand mudra cards are color coded by the chakras they stimulate. I love the conciseness of the information and the way it is organized. It’s very easy on the eyes and enables the data to be quite digestible. You’ll note that the information on all of these cards are found verbatim in the accompanying book. Thus, deck and book can be used as standalones. 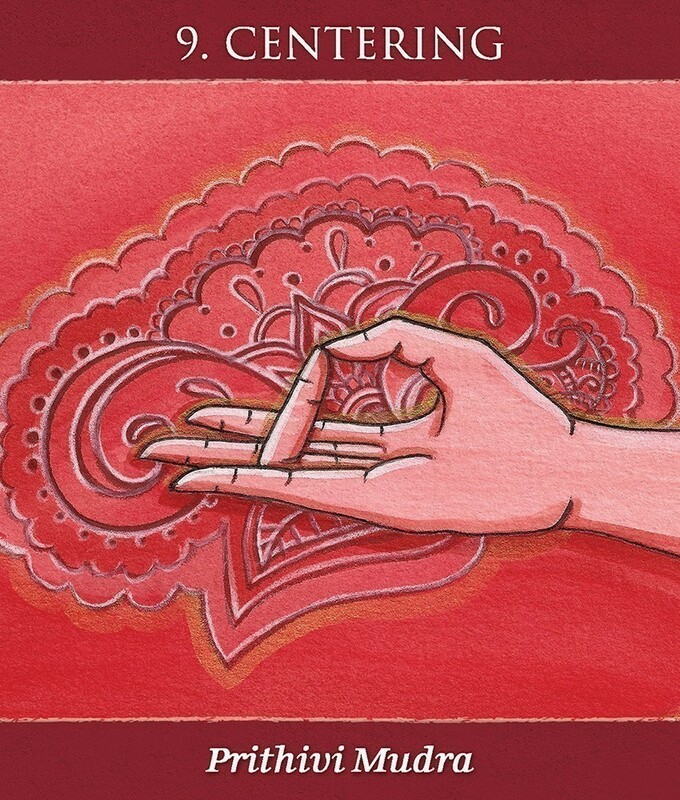 If you want to learn, you can take just the book around with you to study hand mudras. Or you can work with just the cards. And if you only have the cards, it’s okay; you don’t actually need the book to look up any information. All the info you would need is right there on the card. I really love the bright colors of these cards. They bring such a feeling of energy and calm. Then you turn over the cards for more information. Use the “Focus” affirmations to guide your mindfulness. 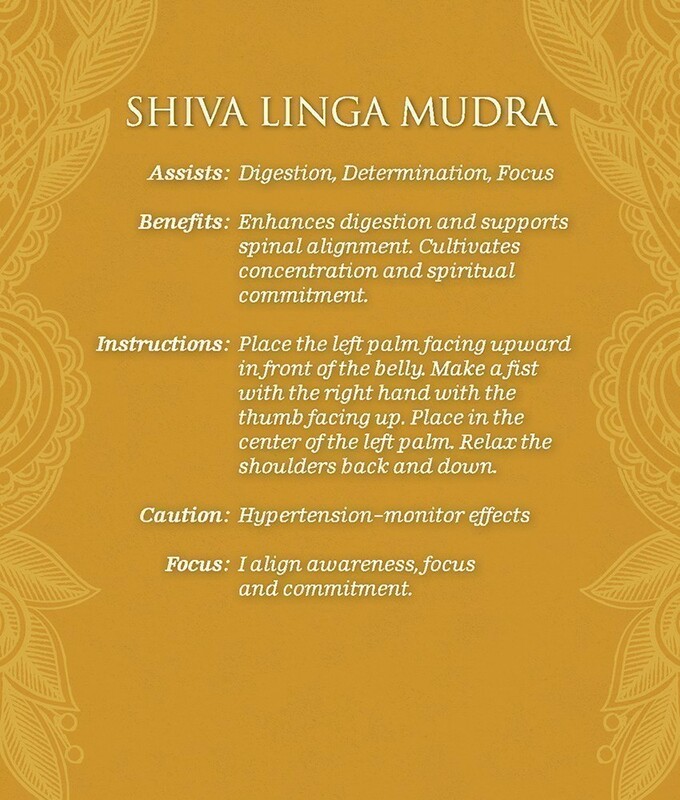 Incorporate the mudras themselves into your yoga or meditation practices. Note the contents of each card and how you might use that information to work on where you are right now in terms of your spiritual path. I found it quite cool that, randomized and drawing the cards out with eyes closed, the sequence of cards per chakras kind of follow the mind, body, and spirit sequence. 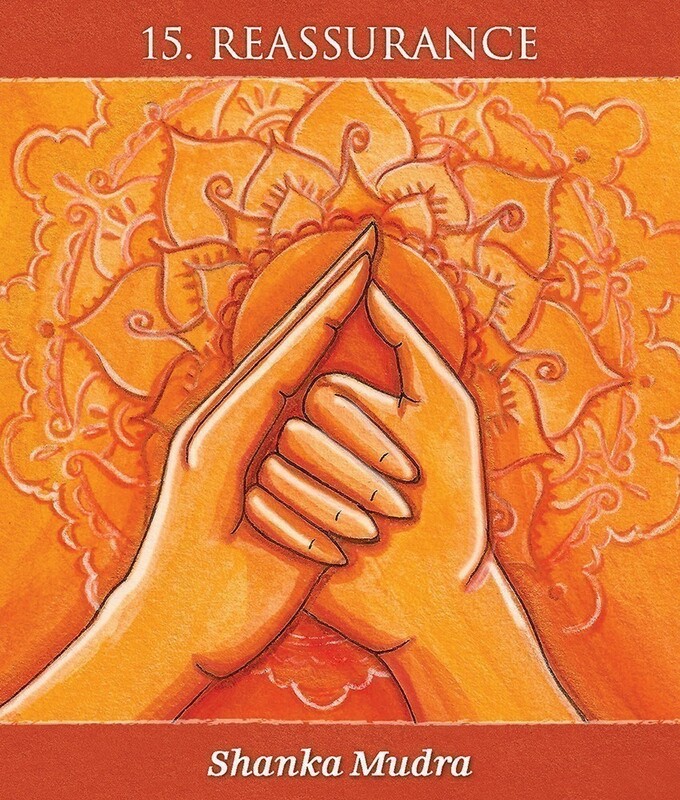 Having a sacral chakra mudra card appear for my mind suggests needing to focus on individuality right now. The root chakra for body makes sense, as does the crown chakra for spirit. You’re going to find the same beautiful synchronicities for yourself when using these cards. There’s definitely a strong calming, spiritual energy about this deck that you can’t help but absorb.